You’ll love Richard K. Amo DDS’s convenient location. 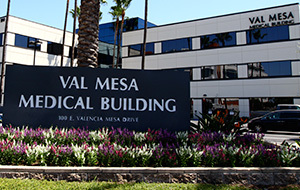 We are located in the St. Jude Medical complex in Fullerton, specifically the 3rd floor of the Val Mesa Professional Building. Open one Friday a month 9:00am-5:00pm and one Saturday a month. Call for availability. We offer all our patients complimentary parking with your appointment. The structure is located behind the building. Just bring your stub with you so we can validate. Also, there is Valet parking in the front of our building for $3.00 if you prefer. We are unable to reimburse for valet.